Supreme. Yeezys. Jordans. BBQ Shapes. 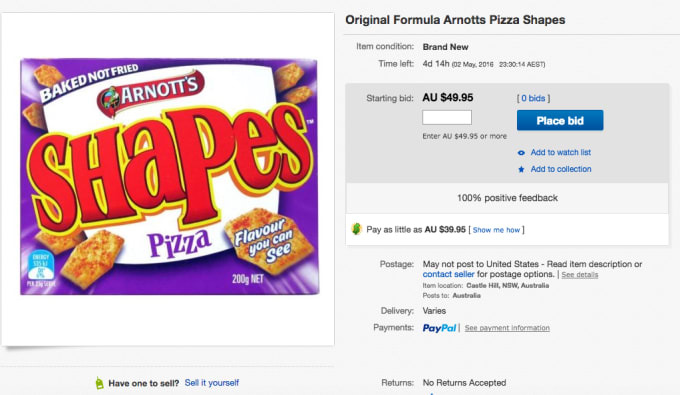 When Arnotts recently changed the recipe of their famous Shapes range, including Australian childhood staples such as Pizza, BBQ and the inimitable Chicken Crimpy, people were pissed. Like for real, pissed. The much-loved, original flavours have vanished from shelves across the country, replaced by a “New & Improved” range of Shapes, which now include MSG and have flavour baked in to both sides of the biscuit. Noticing a demand for the now no longer available originals, resellers have pounced on whatever they could find and are now flipping the Shapes on eBay at incredible prices. Where Coles currently has boxes on shelves for $3.29, a search across eBay will reveal ‘OG’ boxes going for up to an unbelievable $50. The increase of 1420% on RRP is a reseller’s dream. This is like flipping a pair of Yeezys for around $4,000. The pack in the screenshot above includes the following description. Brand new pack of Arnotts Pizza Shapes. These are the original formula before they changed to the terrible new style! Reminisce about all those years of great tasting Shapes for the last time. The venom in the seller’s words is indicative of the general feeling among Shapes lovers, who have bombarded the Arnotts Shapes Facebook page with complaints, as you can see in the screenshots below. It seems Shapes fans are the new #BeyHive.